Ginny's philosophy is that purchasing a home, whether it is a primary or secondary residence, should be an exciting and happy experience, not one of problems and concern. 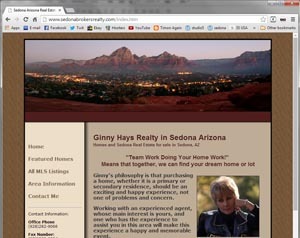 Ginny is a 42 year resident of Sedona Arizona and has been serving in the real estate industry for 40 of those years. Having raised her family here, served on the board of directors for the board of realtors,assisting in the organizing of the multiple listing service, she does possess the knowledge to assist those wishing to relocate to the area. At my site you can search all the current listings of properties for sale in the entire Verde Valley, just click on the button below.